May Day is the most widely celebrated holiday in the world. Hundreds of thousands of workers, led by their unions, will march through the streets in Mexico, South Africa and the Philippines. In the socialist countries where the working people rule society – Cuba, China, Vietnam, Democratic Korea and Laos, May Day, or International Workers Day, is a national holiday. It is celebrated with huge rallies of millions. Leaders make speeches opposing war and imperialism, while praising the gains of the laboring classes who are furthering the cause of socialism. Most of us never learned in school that May Day was born in the U.S.A. It simply was not taught. On May 1, 1886 U.S. workers went on strike for the eight-hour day. The epicenter of this powerful movement was Chicago, where workers fought and died. In the aftermath of this battle, the ruling class extracted revenge. Leaders of the gigantic strike, many of them immigrants, were jailed and executed by the government of Illinois. But for the employers, it was already too late. The heroism and determination of the Chicago working class and those that led them would resonate around the world. The idea of celebrating May Day as International Workers Day quickly spread. From then on, May Day became the day for our class to celebrate our victories and to stand up to those who would rob and oppress us. In 2006, 120 years later, immigrant workers are again marching through the streets of Chicago. On March 10, Chicago experienced a general strike, with over 200,000 mostly Mexican (but along with Irish, Polish, Korean and Arab) workers this time protesting the Republican party’s anti-immigrant campaigns and laws. The capitalist class tries to divide workers by nationality and race, but Chicago’s multi-national working class is answering with workers’ unity and power! This immigrant workers movement will spread to other U.S. cities, promisingly Los Angeles, and send a message of struggle to the entire world. 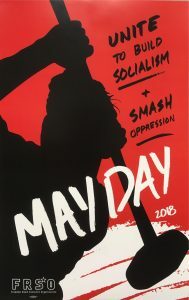 The big lesson of the May Day movement is the same today: the capitalist system is failing the working class and oppressed peoples and we need to replace it with socialism. Hurricane Katrina opened the eyes of every American to the poverty in society and the national oppression Black people survive under. The waters receded only to uncover more bodies and the truth of U.S. society. The U.S. is ruled by the likes of Bush and Brown, and behind them, the rich and powerful billionaires and millionaires. Say it again, “George Bush does not care about Black people.” Over 1000 have died and tens of thousands are left homeless, never allowed to return to their birthplace. Meanwhile the rich are scheming how to make profits from the clean up and to rebuild to suit corporations. The U.S. government did not ‘fail’ the people of New Orleans in the sense it fell short of its intentions. It never planned to save the people of New Orleans in the first place. You cannot fail a test you will not take. But Bush and the system he represents can and will be judged a complete and total failure. Bush’s version of emergency response is to send in troops and police to protect rich people and real estate. The capitalist system has failed the working class – immigrants in fields, factories and restaurants; union auto workers across the country; Black people of New Orleans and the Gulf Coast and anyone who needs a union. We need a system of the people, by the people, for the people – a system where the political and economic power is in hands of the exploited and oppressed. We need socialism. Support Native peoples in their fight against the Dakota Access Pipeline (DAPL)!